Regrettably, my experience with syncing has revealed that this service is just not reliable. I've had a few incidents where syncing two computers via Webbrain sync has not given desired results particularly with respect to internal attachments. Case in point: Today an internal Word document was deleted from my office computer brain (call it WorkBrain) after syncing, having synced the previous evening from my home computer (call it HomeBrain). Luckily I had a printout of the four-page attachment and was able to reproduce the changes I had made at home and submit the document on time. The image shows that ERFA 2014.docx on HomeBrain was probably not transferred to Webbrain the previous evening, resulting in its deletion from WorkBrain the next day. What is curious, is that it remains glued to only HomeBrain even after a normal sync (not a forced sync). This was a real bummer today and I can see the message of choice is mirroring changes of WorkBrain and HomeBrain using external storage media and a reliable synchronizing tool with the appropriate settings (this has proven most reliable!). How can synchronization be made more reliable? One thing that bothers me is that I must open a local brain in order to synchronize it. I presume this step changes timestamps in the local brain files as well as content in some meta data in various tables. 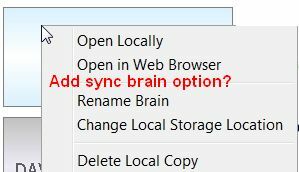 Would it be feasible and advantageous to add an option in the context menu of the list of brains to sync prior to opening the local brain? Would that enhance reliability at all or in any other way be a desirable feature? and make sure you have both dates set for today. I will forward your suggestions regarding sync from the Brains List to our engineers. Doing that results initially in a remote delta-file error message (which I have also had on several occasions). "In a few minutes" it is resolved. It is not clear at all to me how a forced sync can reconcile differences on two different computers and be completely independent of the order or syncing - that is, which computer initiates the forced sync first - or is this not for reconciliation but more for re-alignment? Is there some more detailed info on this process somewhere? It doesn't instill me with confidence. Yes, if you continue to attempt the sync it should eventual succeed. That's exactly the feeling I have: Syncing with WebBrain is like playing the lottery: you do it often enough, you are bound to succeed at some point. I would expect much more from such a service. The WebBrain feels like it is beta testing still and that the users are paying yearly subscription prices to test it out. So much for that. I'll stick to (free and reliable) USB-Stick synchronizations. We're constantly working to improve the cloud and sync capabilities of TheBrain. It is true that some days have more traffic than others (Monday mornings and Friday nights) which can throw you into the queue line for syncing and take longer than expected. Also, your own local network traffic can have an effect, as well as the amount of data being synced. For this reason, the Auto Sync option may be beneficial to your scenario. Basically, syncing less information on a more frequent basis. In regards to your question about syncing from 2 different computers, TheBrain Cloud will always look at the time stamp of the most recent modification. IF, you have a single thought that has been edited on 2 different machines and they are then being synced, the most recent modification will take precedence and be the new version of that particular thought. Again, for this reason, the auto sync feature should alleviate this issue from ever happening, since your Brain will start a sync as soon as it is opened, thus giving you the most recent changes from other machines (given that all other machines are on auto sync as well). I did use the Auto Sync until I realized (and consequently remembered reading about) the empty undo cache as a trade-off. I don't use Undo that often, but this time I did want to go back to a state the local brain was in over five minutes prior (having since added Outlook-generated thoughts, created tags and/or inadvertently duplicate thoughts), only to find no available steps to undo. Still, it is a trade-off I am willing to live with. I'd still like to know more about the force-sync. Please send me any technical tidbit that might be available (and helpful) in understanding that process with two or more local brains to be force-synced. I'll consider this matter closed. By default, when TheBrain syncs (either auto or manual) the first step is to review when this particular Brain was last synced (date and time). The next step is to upload all thoughts, notes, links, attachments, etc. that have been modified since that specific time, as well as download all items modified in that time range on the Cloud end. Checking the FORCE RE-SYNC box allows you to select your own, specific date (other than the date specified by TheBrain's last sync). Typically, a forced re-sync is never needed. But in some rare circumstances, particularly if you notice that some content on TheBrain Cloud has not been updated, a forced re-sync can resolve discrepancies. Does simply accessing a thought change metadata that constitutes a "modification" that needs to be synced? First B then A: B uploads attachment to WebBrain, A gets WebBrain attachment > OK! And what would be the case if the attachment is supposed to vanish? That's... well, interesting, but I was very glad to see that the thoughts which did change in WorkBrain had been updated on HomeBrain!